Coffee beans before they are roasted. Fair Trade is a social movement that promotes fair and sustainable trading conditions for the producers in the developing world. Fair Trade labels are meant to provide a guarantee to the consumers, that the producers of the product, have received a minimum price that covers their average costs of sustainable production and never less than the market price. Furthermore it ensures that the producer has decent working conditions and no forced or child labour was used. The buyer must also pay a Fair Trade Premium that is to be invested in the production, or in other social, economic and environmental developments of their community. For the average consumer the world of Fair Trade labels is a jungle. The United Nations Conference on Trade and Development website lists 33 different examples of Fair Trade labels and not all adhere to the same international standards set by Fair Trade International and the World Fair Trade Organization. Whole Trade is label created by Whole Foods, a company that has a history of refusing their own workers the right to organize in unions, something which is usually considered one of the pillars of Fair Trade. Mundo Verde coffee beans being roasted at Loma Linda Organic Coffee Farm. Coffee is one of the cornerstones of Fair Trade and Guatemala is the worlds eights largest exporter of coffee and has one of the biggest exports of high quality coffee beans. 80 percent of the farmland in Guatemala is owned by just 5 percent of the population and over half the population lives extreme poverty. For the indigenous population the rates are even higher with 75 percent living in extreme poverty according to UNICEF. Fairtrade Foundation lists 22 certified organizations with 12.469 farmers in Guatemala. Many of the small coffee farms are not certified because the annual membership fee would eat a significant chunk of their small annual profit, which they can barely live on as is. The amount of bureaucracy involved in the certification process often becomes too complicated for farmers in rural areas where illiteracy is as high as 60 percent for the indigenous population. The minimum Fair Trade price for Arabica coffee in october 2014 was $2,97 per kilo. The actual market price was $4,98 per kilo. Going back over the past ten years, the market price have been higher than the Fair Trade price. That makes it a sweet deal for the companies that jumps on the Fair Trade marketing wagon as long as the market price is higher than the Fair Trade minimum price. They must pay a small social premium of 20 cents per pound, which is a small price to pay for the added marketing value of having the Fair Trade label. There is a worldwide shortage of chocolate and every year the farmers are producing less than we are consuming. For companies that depend on chocolate supplies like - Nestlé and Mars - it is simply good business sense to pay the extra social premium in exchange for establishing longterm commitments with producers. The fact that it adds to their Corporate Social Responsibility image seems more an afterthought. Quatzaltenango is the second largest city in Guatemala approximately 200 miles from the nations capital Guatemala City. The city has an estimated population of around 225.000 and it is the centre for the regional Department also known as Quetzaltenango. The city is more commonly referred to by its inhabitants by its original Maya name Xelaju or Xela. The city has an large indigenous population of roughly 60 percent and the primary languages are the Maya languages Quiché, Mam and Spanish. The indigenous population is much higher in the rural areas of the region. Y’abal started as an small NGO in Guatemala in the aftermath of Hurricane Stan in 2005. The purpose was to provide aid and support for the two small communities Pacutama and Chuicutama that had relocated to the mountains in the Western Highlands. Melissa Wiams, a volunteer from Belgium, started the women's weaving project in 2008, which would later transform the NGO into a sustainable business. The transformation from aid to trade has helped the women develop their skills and turned them into a textile cooperative that provides a vital part of the communities income. In their costal home they were coffee and banana farmers but the high altitude and the freezing night temperatures makes it hard to cultivate the land in the Highlands. Without a steady form of income the men have to take short day jobs whenever they can. Sometimes far away form their families and with very low wages. Some risk the hazardous journey of migrating illegally to the United States of America looking for ways to send money to support their families. Through workshops and collaboration with foreign designers, they have created alternative products that combines traditional back-strap weaving methods with Maya symbols and contemporary European colors and design. The business model of Y’abal Handicrafts has always been based on fair wages and good working conditions. They have continued the NGO tradition of offering interest free micro-credit loans to men in the communities and they have invested in communal projects such as the water system and the local health centre. As the business has grown Y’abal Handicrafts also look outside the two communities for producers. Telma and Luis live outside Momostenango and run a family business making blankets and carpets from wool. 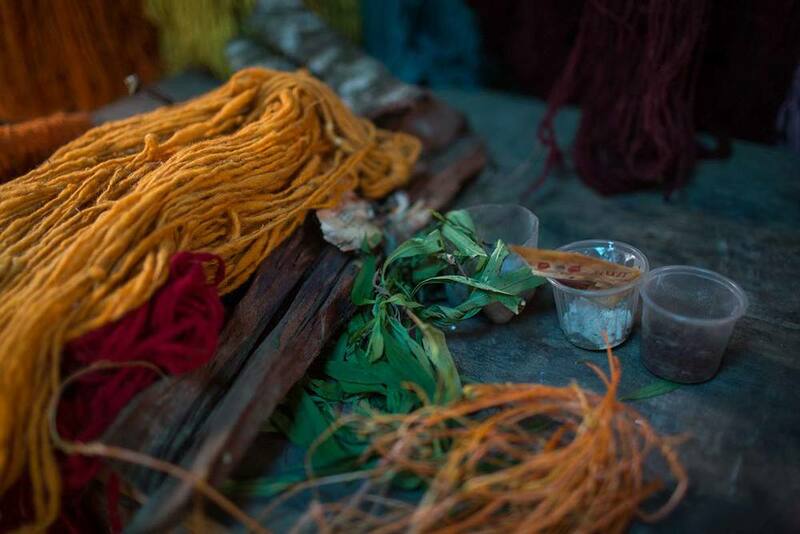 They dye their own wool using only organic materials such as bark, berries, flowers and bugs. The family is in full control of the whole process from shearing of the sheep and spinning the wool, to the finished product. Organic products are often associated with Fair Trade products and it is becoming more natural for a product to be both organic and Fair Trade certified. Where Fair Trade tends to focus on the benefits of the producer, the organic movement has focus on the environmental impacts, but both concepts appeals to the conscious consumer. 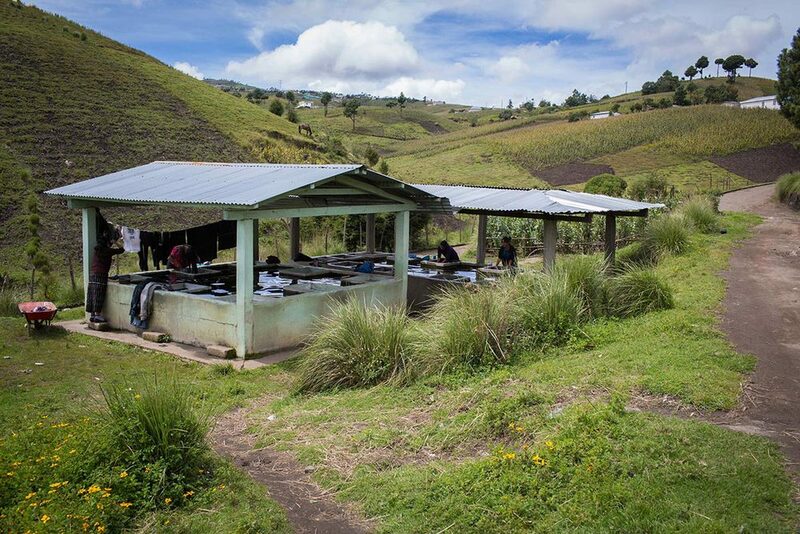 The Santa Anita Organic Coffee Farm is a cooperative made up of 35 families from a group of former guerrillas. The world is overflowing with products and it would be impossible for the conscious consumer to research every product in order to make the right ethical choice. Therefore we put our trust in labels to guide us in our daily shopping. It is disconcerting when the labels fail to live up to our ideals, but it can not be denied that the Fair Trade movement has been instrumental in putting unfair trade on the agenda. Fair Trade labels have raised the awareness of the poor conditions under which our products are produced and it has forced consumers to start to question the business methods of the companies that sell us everyday things. The issues are much greater than debating wether or not a label has credibility. The underlying problem is that the “Free” market is anything but a fair market.